Time for a little excursion with the boys. Nothing big, just a short hike and then lunch out in the bush somewhere close to home. Sandwiches just don’t appeal, I love something hot for lunch. Let’s see, what do I have on hand to cook with that is light, easy to use and will get the job done? Nothing. Our two-burner Coleman stove is just too big and heavy and I don’t have any other cooking equipment. Have you checked out the prices of camping equipment lately? Yikes! Way beyond what I am comfortable spending. Thanks to YouTube, I have gathered and made everything I need for cooking lunch for a total cost of… $0.01. I kid you not, I have recycled and re-purposed everything in my sweet little hiking lunch cook set. My setup is this: I made a little alcohol stove from two scrounged used pop cans (thanks Wayne), the priming tray was fished out of the recycle bin (it was the top from one of the kiddos Easter treat tins turned upside down) and the stand/wind break was also fished from the recycle bin (cut from an empty chili tin). Oh, and I can’t forget the penny – this was my big-ticket item at $0.01 that came from my small stash of loose change. I also have another can to smother the flame when the cooking is done (I will be switching this out with a pop can bottom in the very near future. Voila! 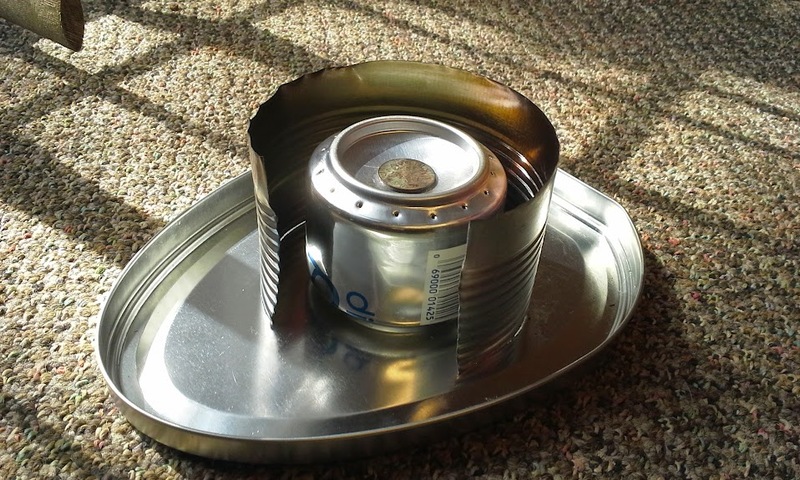 Portable stove. The ideal fuel would be denatured alcohol, but I don’t have any on hand. I do, however have plenty of 95% rubbing alcohol, so I’ll be using that for fuel. Okay, so now I have everything I need except experience. So this morning I decided to give it a trial run. At lunchtime today I went outside and cooked my lunch. I made two scrambled eggs with veggies. Kit and food in hand, I went out the back door thinking that a little privacy for my lunacy would be nice, but the wind was far too strong. The best location ended up being right outside the office front door. So, I sat on the curb with all the trucks coming and going in our yard and made my lunch. I’m so pleased with how the trial went, it was a success – I had hot, and rather tasty, food on my plate in under fifteen minutes with minimal frustration, mess or cleanup. The kit held up well and the flame didn’t go out despite a stiff wind blowing through from time to time. The only thing I forgot to bring was a lid to keep the heat in the pan – I had to improvise with a small piece of tinfoil. So the next step is to take it, along with the boys, outside!